Enjoy a satisfying meal at Uttoxeter Thai restaurant serving guests of Bank House Hotel. Wrap up your day with a drink at the bar/lounge. English breakfasts are available daily from 7 AM to 9:30 AM for a fee. As a small market town tucked away in Staffordshire, you might be surprised by how much there is to see and do in and around Uttoxeter. The town offers a range of hotels from the simple and functional, to charming bed and breakfasts and glamorous spa retreats. On a short visit to Uttoxeter, visitors can admire beautiful English church architecture, taste locally sourced food at one of the town markets and spend a day in the internationally renowned Peak District National Park. 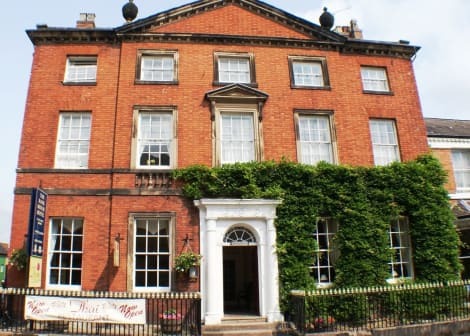 Uttoxeter hotels offer you the unique chance to experience peace and wonder in a quiet corner of the country. Uttoxeter is host to the first design of the famous architect, AWN Pugin, in the form of St Marys Roman Catholic Church on Balance Street, finished in 1839. A few miles north of the town you will find the beautiful remains of Croxden Abbey, now an English Heritage site. Parts of the Abbey date back to the 12th century, with finely detailed walls of over 18 metres still extant. The Redfern's Cottage: Museum of Uttoxeter Life is a restored 17th-century timber-framed building housing a collection of 17th to 19th century artefacts pertaining to local Staffordshire history, such as original trade tokens and reconstructed domestic settings. At the heart of Uttoxeter is the town's renovated Market Place. Typically designed with a war memorial at its centre, the Market Place comes alive on Wednesdays and Saturdays for the weekly market, where you can find a huge range of fresh, local produce as well as hand made craft items at the indoor market in the Town Hall. On the second Saturday of each month Uttoxeter also hosts an indoor Farmers' Market, with goods ranging from fresh vegeSEOSITE_LEVEL_DESCRIPTION produce and gourmet foods to traditional Staffordshire meats. Uttoxeter is ideally located for a day at the races. The Uttoxeter Racecourse is a National Hunt racecourse and hosts the Midland Grand National as well as 25 other race days throughout the year. If you come to Uttoxeter with children, a short daytrip to the UK's biggest and most popular theme park can't be missed as. With a huge number of themed rides, water rides and rollercoasters, the Alton Towers Resort offers a full family day out for both adrenalin junkies and young children alike. An adventure into the internationally visited Peak District National Park is only 20 miles from Uttoxeter, and provides the perfect opportunity to explore the countryside surrounding the town. Take the Derwent Valley Heritage Way walk to experience the park's glorious natural beauty as well as some of the area's charming train stations and heritage sites, such as the mighty Chatsworth House.